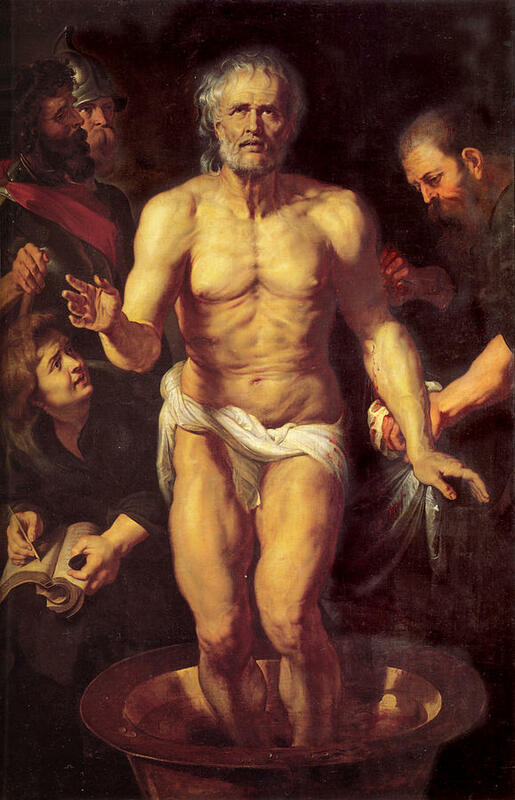 The death of Seneca, as depicted by Rubens in the early seventeenth century. If you can withhold moral judgment, Dying Every Day: Seneca at the Court of Nero is a great historical account of making decisions in complex situations. By a strange twist of fate, a man who cherished sobriety, reason, and moral virtue found himself at the centre of Roman politics. He did his best to temper the whims of a deluded despot, while continuing to publish the ethical treatises that were his true calling. When he could no longer exert influence in the palace, he withdrew and in solitude produced his most stirring meditations on virtue, nature, and death. Enraged by his departure, the emperor he had once advised seized on a pretext to force him to kill himself. His adoring wife tried to join him in his sober, court genus suicide, but imperial troops intervened to save her. A clever manipulator of undistinguished origin connived his way into the centre of Roman power. He used verbal brilliance to represent himself as a sage. He exploited his vast influence to enrich himself and touched off a rebellion in Britain by lending usuriously to its inhabitants. After conspiring in, or even instigating, the palace’s darkest crimes, he tried to rescue his reputation with carefully crafted literary self-fashioning. When it was clear that the emperor’s enmity posed a threat, he sought refuge at the altar of philosophy even while leading an assassination plot. His final bid for esteem was his histrionic suicide, which he browbeat his unwilling wife into sharing. These are the opposing frames by which Romans of the late first century A.D. regarded Seneca. Tacitus, perhaps the greatest Roman historian and by far the best source we have today for Nero’s era, stood between these extremes. Tacitus, a shrewd student of human nature, was fascinated by the sage who extolled a simple, studious life even while amassing wealth and power. But ultimately Seneca posed a riddle he could not solve. Tacitus made Seneca the principal character in the last three surviving books of his Annals, creating a portrait of great richness and complexity. But the tone of that portrait is hard to discern. Tacitus wavered, withheld judgment, or became ironic and elusive. Strangely, though aware of Seneca’s philosophic writings, Tacitus made no mention of them, as though they had no bearing on the meaning of his life. And he passed no explicit judgment on Seneca’s character, as he often did elsewhere. Our most detailed account of Seneca, in the end, is ambivalent and sometimes ambiguous. But isn’t this the case with all of us? Well-intended actions can be viewed through a lens of deception and manipulation just as outright manipulation can be viewed as aid. The truth is more complicated than binary answers. Debates about outright altruism still carry on today. The truth is we all live complicated lives. Most of our actions fall somewhere between evil and good, failing to land on either extreme. Of course, we have problems seeing ourselves as others do. In our minds, we are the hero. Laying complexity on top of this is the nature of the situations. Seneca was in exile and flattering Nero was his only hope to return. Perhaps it was hope that he could impact the world and perhaps he just wanted to come home from exile. We will never know as motivations are inherently complicated. Seneca never answered these questions directly but he pondered them in a mythical parallel: Thyestes. The tragedy was likely composed during his time at Nero’s court or shortly thereafter. Seneca used the conflict between two royal brothers—Atreus, a bloody autocrat possessed by spirits of Hell, and Thyestes, a gentle sage trying to stay out of politics—to wrestle with questions that his own strange journey had raised. In the beginning, Atreus is the ruler of Argos, solely in command. The complication becomes that he was supposed to rule in turns with his brother Thyestes. Thyestes has gone into an exile that Seneca depicts as a philosophic retreat, a communion with Nature such as he himself had claimed to enjoy on Corsica. But Atreus, infected by the demonic spirit of his grandfather Tantalus, is bent on destroying his brother, whom he regards as a threat. He sets out to lure Thyestes back to Argos, then enact a diabolic plan: to feed his brother a banquet of his murdered children’s flesh. The conflict is neither a coded version of Seneca’s relationship with Nero, nor an allegory contrasting political ambition with philosophic detachment, but it contains elements of both. He could not be caught—unless he wants to be caught. He yet covets my kingdom. Thyestes faced the same choice that Seneca faced on Corsica. This is perhaps the best insight into the nature of Seneca’s conflict. Why does Thyestes return to Argos, while claiming to hate what he will find there? He makes his choice passively, almost fatalistically. As his children urge him onward, he appears to surrender: “I follow you, I do not lead,” he tells them. He has resisted long enough to satisfy his own conscience. He will resist further when Atreus offers him the sceptre, but he accepts this as well; it was, as Atreus had divined and as Seneca finally makes clear, what he had wanted all along. Rather than staying in virtuous exile, Thyestes opts to return. A choice that would have been familiar to Seneca. Thyestes’ nature was human. While Seneca depicts Thyestes as trying, his effort falls short. Seneca’s prose works offer forgiveness, but in the bleak world of the tragedies, the sin of weakness comes back on the sinner’s head a thousandfold. In a gruesome messenger speech, we hear how Atreus butchered, filleted, and stewed Thyestes’ children. Then we watch as Thyestes unknowingly consumes the horrid casserole. ATREUS: And I entrust your punishment—to your children. Wretches, either we lost our sun, Or else we drove it away. In these words we hear Seneca’s voice. The sky had become black and the only way out was death and yet he lived on. The last words of the play’s apocalyptic chorus mention a theme that would occupy Seneca in his last years: Suicide. Greedy for life is he who declines to die, along with the dying world. Part biography, part narrative history, and part exploration of Seneca’s writings, Dying Every Day: Seneca at the Court of Nero is an effort to bring the two conflicting views of Seneca into a single personality.